The Power of Two Working For You! Two generations of professional, friendly service! Rodeen began her real estate career in 1979. The first week on the job she was told by a co-worker to find a house for his clients and he would split the sale. Rodeen did not hesitate, she called streets, went out and knocked on doors until she found a house to list for this client. This all happend very quickly and only 2 weeks on the job she had her first listing and sale take place. Rodeen realized that she had found her passion and has never looked back. Working hands on and always giving 110 percent to her clients Rodeen works mainly on referral and repeat business. 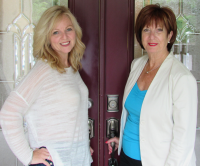 Rodeen has constantly been a top award winning realtor in her office. She strives for the best for her clients and has successfully and continuously achieved Sutton's prestigious Platinum Plus, Diamond, and Masters Award. Specializing in York Region, Durham and the GTA, you know that you will always receive outstanding service and complete follow through. She prides herself with providing the highest quality of professional service and utilizing marketing tools available. Tami began her Real Estate career in 1989 selling New Homes, successfully selling 100 homes in 2 weekends. Being highly motivated she was also in school at the time receiving a degree in Advertising/Visual Merchandising Arts. It was a natural transition to Real Estate growing up as Rodeen's daughter as she lived and breathed real estate from a very young age. Tami learned from the best! Recently receiving the prestigious Masters Award 2015 and Diamond 2016. Tami's clients know that she can be depended on for outstanding service, great negotiation skills and complete follow through. Assisting and making her clients real estate dreams come true while carefully paying attention to their needs and wants. Listening and being a keen observer are the keys to achieving success. Subscribing to a very high code of ethics, ongoing professional development training and members of Canadian Real Estate Association, Toronto Real Estate Board and Certified Negotian Expert. Rodeen and Tami live and work with the philosophy that hard work, commitment, honesty, and a positive attitude are an everyday essential. Proven results in sales , while assisting our clients every need.